When most people think of antique Old English dining room chairs they are thinking of the Jacobean style. Jacobean, or Renaissance Revival, was popular from the late 1800s to the early 1930s and is very easy to identify. The Jacobean Revival style is patterned after the heavy, dark, and intricately carved furniture that was used by royalty in the Middle Ages and up through the Renaissance. One of the most significant features of this style is the use of black oak, often called bog wood. Unvarnished, and over a period of years, it develops a deep ebony color with a dull finish. Furniture makers found that they could replicate this look quickly with the careful use of stains and lampblack. This particular style can be tricky to decorate with in modern houses. 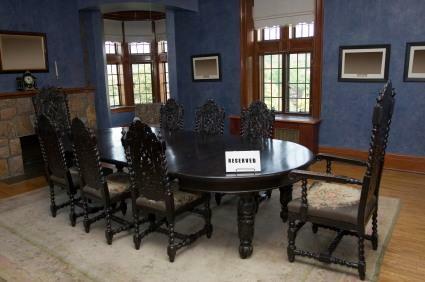 The size and visual bulk of the furniture almost requires the huge banquet rooms of old. Barring that, a Victorian dining room might work. That isn't to say that this style of chair won't ever work in a 1950s Ranch style tract home. It just needs to be done with an eye toward balance. Since many antique old English dining room chairs are quite dark, it is a good idea to have them in a medium-toned room. Stark white will be too much of a contrast, while any dark color will cause the room and the chair to become dungeon-like. A warm medium tone like sage or maize will accent the furniture without making the room look small. Jacobean Revival dining room chairs are not good candidates for the mix and match type looks of the cottage style. They are more suited for a formal look, complete with wainscoting, draperies, and cranberry glass. If you wish to use them as single pieces, rather than in a table setting, consider using these beautiful chairs as accent chairs in other rooms. Generally a dining set will come with two chairs with arms for the head and foot of the table and at least two armless side chairs. There are numerous places to find antique chairs of all sorts. Check out your local thrift shop on a regular basis. You may be surprised to see what comes in. The same goes for garage sales and especially estate sales. Leave your name and number at antique stores so when the owner finds what you are looking for, he can contact you. Check to make sure the joints are tight. Turn the chair over and look underneath for cracks, old repairs, or evidence of new staining. If it is stamped "Made in China" it isn't an antique! Check for wear on the back and on the arms. Check the chair feet for stability. Upholstery can always be changed if it is torn up. Look for structural integrity. Ask questions if you are unsure. If your antique old English dining room chair needs repair consider doing it yourself. Many furniture refinishers aren't experienced in antique repair and those who are can be expensive. Van Dyke's is a great place to get the supplies you may need. They also carry a good selection of books on the subject. Your antique dining room chairs do not need a lot of special care. Remember, they have managed to survive many years without special treatment. Use common sense when caring for them but don't be obsessed with protecting them. The very best thing about antiques is that most of them are meant to be used and enjoyed, not just looked at. Treat your dining chairs gently but enjoy them to the fullest.